Bhaggmati | KMI Music Bank, your bollywood specilist! India's 1st feature film in Animation and live action. The film is based on the legendary love story of the prince of Hydrabad, mohammed Qutb Shah and his ardent love. The beautiful Bhaggmati born in an ordinary family. Mohammad Qutb Shah was known for his artistic and poetic bent of mind. 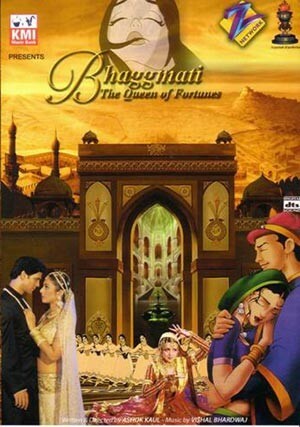 Bhaggmati was the most beautiful woman in hydrabad. these two unforgetable characters shaped the destiny of this greate city through their undying love for each other. The legendary film celebrates love cultural intercreation & communal harmony. The film has taken three years of painstaking work with no use of foreign expertise. Director Ashok Kaul says that Bhaggmati - The Queen Of Fortunes is different from USA films like Roger Rabit and Spacejam where both live and animated characters were used together. He adds that the animation has been used as a form of narration to unleash the story and the stars are the animated characters. Tabu, Milind Soman and Hema Malini star this three hour long film, 90 minutes of which is pure animation. Vishal Bhardwaj has composed the music. Kaul and his team of 120 animators from Zee Institute of Creative arts have made this 35-crore film. India&#39s 1st feature film in Animation and live action. The film is based on the legendary love story of the prince of Hydrabad, mohammed Qutb Shah and his ardent love. The beautiful Bhaggmati born in an ordinary family. Mohammad Qutb Shah was known for his artistic and poetic bent of mind. Bhaggmati was the most beautiful woman in hydrabad. these two unforgetable characters shaped the destiny of this greate city through their undying love for each other. The legendary film celebrates love cultural intercreation & communal harmony. The film has taken three years of painstaking work with no use of foreign expertise. Director Ashok Kaul says that Bhaggmati - The Queen Of Fortunes is different from USA films like Roger Rabit and Spacejam where both live and animated characters were used together. He adds that the animation has been used as a form of narration to unleash the story and the stars are the animated characters. Tabu, Milind Soman and Hema Malini star this three hour long film, 90 minutes of which is pure animation. Vishal Bhardwaj has composed the music. Kaul and his team of 120 animators from Zee Institute of Creative arts have made this 35-crore film.